It is worth noting that the current 7.8.24 release is a Beta one. We are also discussing the Global ROM version, although the Chinese Developer ROM is in pretty much the same boat as far as compatible devices go. You can check that out at the second source link, in case you want to run your device on the Chinese software branch. As for update instructions, you can simply use the MIUI Updater app if you are already running on a MIUI 8 Global Beta ROM. MIUI V5, MIUI 6, MIUI 7 and MIUI 8 stable ROM users need to go the fastboot route to flash the ROM, which does entail a storage wipe. This last batch should get the Beta some time by late September. The new MIUI 9 brings Smart app launcher, Image search, and Smart assistant. It also has a particular CPU acceleration mode and better haptic feedback. The eagerly-anticipated Android Nougat split screen feature should also be a part of the update, but some models might not get it immediately or at all. The jury is still out on that one. Beta dude... Do you read? BETA! 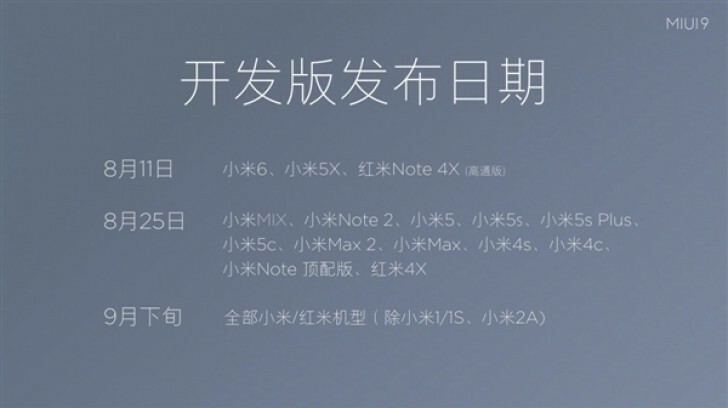 Xiaomi most expensive phone MI MIX still without MIUI 9. this news is not true. It is hard to understand what you are complaining about. Bootloader unlocking takes 15 minutes for Xiaomi devices, what is your problem?